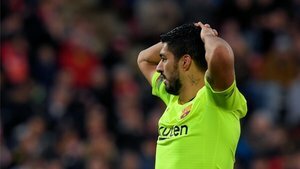 Ajax sporting director Marc Overmars has spoke in an interview with 'VTV Uruguay' about Barcelona striker Luis Suarez and the role Frenkie de Jong could have at Camp Nou. Overmars: "Si sé que Luis Suárez quiere volver al Ajax, viajo a Barcelona mañana mismo"
Asked about the possibility of Barça looking for a Suarez replacement, Overmars was clear: the striker can return to Ajax whenever he wants. "Suarez can come back to Ajax," he said. "The doors are always open here. I hope they replace him [laughs]. No, I'm joking (...) but if he was really interested in coming back to Ajax, I would go to Barcelona the next day to speak with him." Overmars added: "I think one of Suarez's biggest qualities is his mentality. The power to win, to score goals... he is one of the best in the world." On De Jong's move from Ajax to Barça for 75 million euros, he said: "It's important for Barça to have players like De Jong. With his talent, at his age, he could become a Xavi or an Iniesta. "[Barcelona] have to bring through their own players and mix them with good players from elsewhere. De Jong's not Messi, there's only one [Messi]. But he's a player that fits in really well at Barça. I'm excited to see him there next season."